I am excited to be joining several blogging friends to share some book related crafts and activities with you each month as part of a new little group called the Poppins Book Nook. On the last Monday of each month we will feature a different book based on the same theme. This month our theme features princesses, knights, and castles! 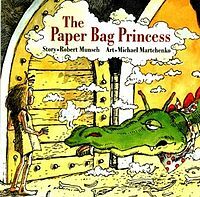 The Paper Bag Princess by Robert Munsch is one of my all time favorite princess books. I love the strong princess that is depicted in the story. I love the twist in the story that has the princess saving the prince... and I think Michael Martchenko's illustrations are darling too. 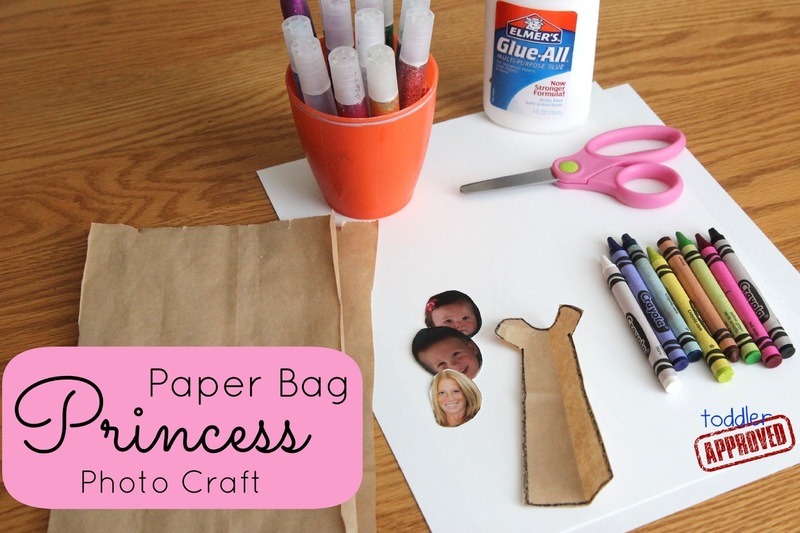 After we read this simple princess story we decided to make a paper bag princess photo craft. We grabbed some materials and photos and started creating. Supplies: brown paper bag, scissors, photo of your child, glue, glitter glue, crayons, cardstock, and other embellishments (sparkles, jewels, stickers, etc). First I cut out a picture of my daughter's and my face since this was a mommy and me project that we were doing side by side. Then I drew simple bodies and cut out a simple paper bag dress (ignore my somewhat ugly drawings!). My daughter is two and not familiar with scissors yet... if she were a little older I would've had her cut her own dress. 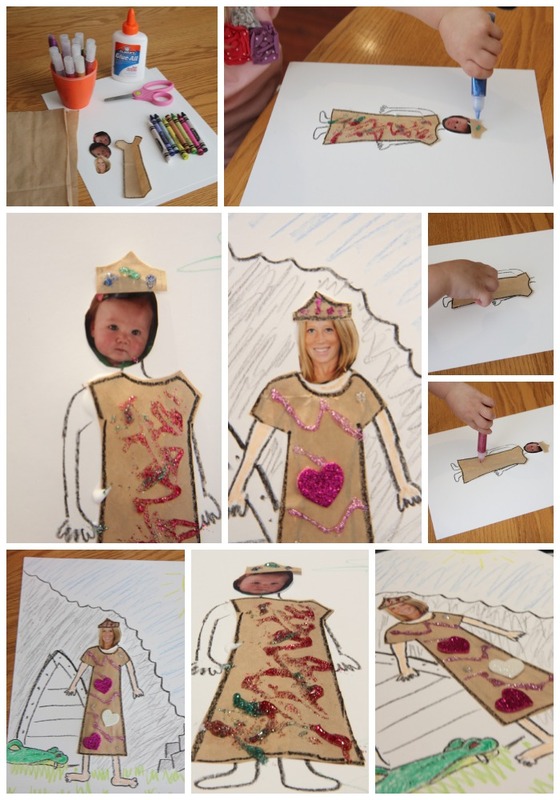 Once the photos and dresses were cut, we glued our faces and dresses on our princesses and then we decorated the paper bag dresses to jazz them up a bit! We also gave our princesses a crown. While we crafted, we chatted about how the princess didn't need to marry a prince that was mean. We also talked about the strong princess and how she did a good job saving the prince from the dragon! We colored our pictures once we were done. My daughter had fun drawing her current favorite animal (snakes) all around her princess. This project didn't take longer than 10-15 minutes, but was a simple and fun way for us to spend time together after we read our new story. I think I had just as much fun as my daughter! I love when we get a chance to have Mom and Tot Craft time. If you noticed above, I also had a photo of my son ready in case he wanted to make a paper bag princess or prince with us... but he opted for Legos instead. There are loads of other princess/castle/knight themed books and activities being shared as part of the Poppins Book Nook this week. Click on the links and thumbnails below if you want to get some more ideas. Have you read the Paper Bag Princess? What craft or activity would you do along with this book? Bloggers Participating in the Poppins Book Nook are listed below. Head on over to check out what they shared! By the way, Have you entered our Great Big Gruffalo Giveaway yet? TWO lucky Toddler Approved readers will get to win an awesome prize pack in our Great Big Gruffalo Giveaway that is going on right now... so click here to enter! I love the craft! The paper bag bodies are super. Very cute! They even got fancy paper bags! Love the paperbag clothes! Clever! What a great way to reuse paper bags! What an adorable and creative craft! My daughter would love doing this craft with the storybook. I love this book and this author. He is very fun to read. I love this Poppins Book Nook. So many great ideas and all so very different! !